In the winter of 1765-66 a sixty-six year old Quaker from Pennsylvania named John Bartram, accompanied by his son William Bartram, traveled in a dugout canoe to explore East Florida's most important waterway, the St. Johns River. East and West Florida had become British colonies only two years before, after Spain ceded Florida to Britain at the Treaty of Paris that ended the Seven Years War. Little was known in Britain about these new colonies in 1763; Florida had not prospered under Spanish governance, and soon after the British flag was raised over the Castillo de San Marcos in St. Augustine, the capital of East Florida, 3,500 Spaniards departed for Cuba. Only three Spanish families remained, and no European settlements could be found outside the town walls in the vast, empty, and mostly uncharted wilderness that Governor James Grant characterized as a "New World in a State of Nature" soon after he arrived in 1764. But in London the new British province soon became the subject of great fascination and speculation. Potential investors anxious to people the new colony and exploit its resources clamored for maps and evidence of the qualilty of the soil and water. King George III therefore appointed a royal botanist to explore East and West Florida and report back to London. The man selected was John Bartram, a respected naturalist who had traveled widely in the New England colonies. In April 1765 King George III awarded Bartram a stipend as a royal botanist with the expectation that he would explore Britain's new Florida provinces. Bartram's friend and patron, the London merchant Peter Collinson, had arranged the royal appointment and promised to provide financial assistance for a journey of exploration in Florida. Collinson recognized that Bartram would need assistance traveling through an uncharted wilderness, and urged him to take along his twenty-six year old son, William Bartram. Collinson regarded William as "a very ingenious young man" with "a general knowledge in natural things" and a special talent as a nature artist. William, living in North Carolina at the time, immediately expressed his "great desire in Going with thee...to be a help and Comfort to thee in what Ever afflictions or trouble thee should meet within thy long and tedious Jurney." John joined his son in North Carolina on August 6, 1765, and the two men headed for East Florida on horseback, stopping in South Carolina and Georgia along the way to collect plant specimens to ship to Collinson. They observed enslaved Africans at work, and sketched flowers, plants, and birds. When in the countryside, they rode through the heat of day and sometimes slept in corn cribs or in forests tormented by mosquitoes. They arrived in St. Augustine late in the afternoon of October 11th. John, suffering from malarial fever, recuperated in his room for most of the next month, but was able to ride to Fort Picolata to observe treaty negotiations between British officials and leaders of the Creek and Seminole Indians. After returning to St. Augustine, John was again confined to his room, still suffering from malarial fever. On December 19th, after repeated urging by Governor Grant, the Bartrams began exploring the St. Johns River. They did not return until February 13, 1766, after nearly eight weeks of dangerous and exhausting travel. They had investigated the shores of the St. Johns from its merger with the Atlantic Ocean to lakes Ruth and Loughman on the south, near what they mistakenly assumed to be the river's headwaters. In all, they had covered a distance of more than 500 miles. Along the way John measured and judged the quality of the soil, plants and trees and recorded his thoughts in a daily diary, while William filled sketch pads with his observations. Back in St. Augustine, Governor Grant provided a room for Bartram to convert his diary entries into a travel journal and to draw a corresponding map to guide prospective investors to choice sites along the river. In mid-March Bartram delivered the journal to the governor and departed for Philadelphia. The journal was sent to London and incorporated into the second edition of Dr. William Stork's A Description of East-Florida, with a Journal Kept by John Bartram of Philadelphia, Botanist to His Majesty for the Floridas; upon A Journey from St. Augustine up the River to St. John's as far as the Lakes that was published by the Board of Trade and Plantations in 1766. Bartram's travel journal was widely read in Britain and helped fan the flames of "Florida Fever" that prompted numerous British aristocrats and merchants to acquire tracts of land in East Florida. His careful measurements of the depth and composition of soil strata, along with practical observations of East Florida's rivers and creeks, wetlands and savannahs, and oak and pine forests effectively encouraged future British settlements in the new colony. "As the King's Botanist in the colonies," Thomas P. Slaughter has written, "his job was to be of use to the Empire, to discover curious plants and provide information that would help extract value from the American possessions." William Bartram returned to East Florida on his own in March 1774 to conduct another investigation of the St. Johns River. For eight months he traveled in a small sailboat up and down the same waterway he and his father had explored in 1765-66, adding horseback journeys to Seminole Indian villages in what are now Alachua and Leon counties as well. William Bartram's journey was financed by Dr. John Fothergill, a wealthy English physician and naturalist, who received in return plant specimens and sketches of birds, fish, flowers, and plants, and an important manuscript that is still utilized by scholars: "Travels in Georgia and Florida, 1223-24: A Report to Dr. John Fothergill." After leaving East Florida in November 1774, Bartram continued his naturalist's pilgrimage throughout the southeastern colonies of British North America. He did not return to his family home near Philadelphia until January 1777. By then, Pennsylvanians and other North American colonials were engaged in a bitter war for independence. The Bartrams' former patrons in London had become the enemy. Like his father, William Bartram recorded his observations in a journal. After reuniting with his parents in 1777, Bartram lived and worked for the rest of his life at his father's farm outside Philadelphia, and transformed his travel journals and memories into a narrative that was finally published in Philadelphia in 1791 as Travels Through North and South Carolina, Georgia, East and West Florida, the Cherokee Country, the Extensive Territories of the Muscogulgees, or Creek Confederacy, and the Country of the Chactaws. The book is still in print, in several editions. 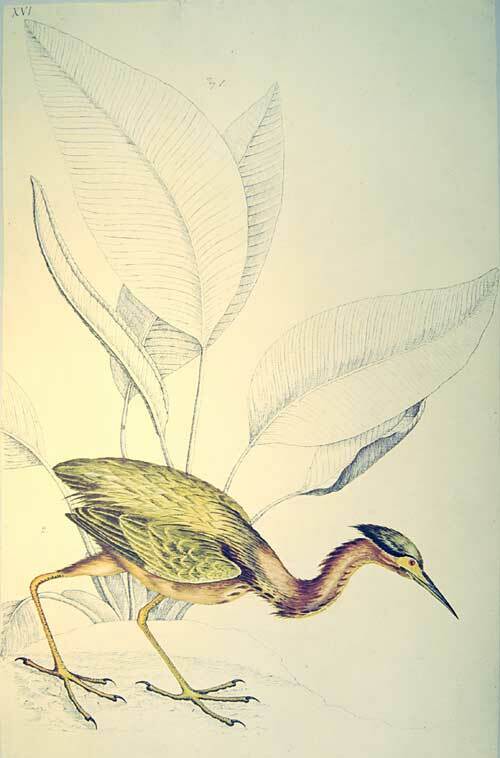 “Little green Bittern, a pretty bird,” is the title William Bartram chose for this drawing. He also called it a “Green Heron.” Courtesy of the Natural History Museum, London. The webpage that follows is intended as a travel guide to East Florida's most important waterway as it appeared in 1765-1766 before the natural terrain was transformed by Europeans. John Bartram was the first person to systematically explore the St. Johns River and leave a written record of his observations. European plantation development had just begun when Bartram wrote his journal. Only a handful of settlements could be found in the lower valley of the river. Spanish colonists from 1565 to 1763 had done little to alter the natural setting, and the hand of Florida's Native Americans had passed only lightly over the river's shores. The ceremonial mounds and burial middens that rose along the shores fascinated the Bartrams and were frequent subjects of their journal entries. But the mounds were widely scattered over a vast terrain, and the nearby ruins of "old fields" where Florida's indigenous Indians had once harvested corn and other provisions covered only fifty to one hundred acres at each site. Soon after the British planters and their enslaved Africans arrived, however, the forests were cleared, marshes were drained, fields were cultivated, and the face of the river valley changed forever. It was the British who brought the plantation era to Florida; Spanish and American successors merely expanded the extent of developed land. Subsequent forms of economic development, whether mills, power plants, factories, or recreational and residential communities, only accelerated and elaborated the transformation. The real value of the Bartrams’ observations, therefore, is that they open windows on the St. Johns River before European plantation development occurred. Through John's journal and William's literary musings and drawings, viewers can capture the essence of the St. Johns River valley in its natural setting. Viewers are invited to follow in the wake of the Bartrams' battoe, a large "dugout" canoe shaped from a cypress log, that carried them on an epic 500-mile journey of discovery on the St. Johns River between December 19, 1765, and February 13, 1766. The core of the river tour is the journal John Bartram wrote in March 1766 that was published in William Stork's A Description of East-Florida. It benefits from the reliable work of Francis Harper, who edited that journal and published it as John Bartram, "Diary of a Journey through the Carolinas, Georgia, and Florida, from July 1, 1765, to April 10, 1766", Transactions of the American Philosophical Society, n.s., Vol. XXXIII, Pt. I. Philadelphia, 1942. The St. Johns River tour begins December 20, 1765, at the place Bartram launched his famous journey, Beauclerc Bluff Plantation. That location is marked on a map of the St. Johns River valley and keyed to the date of the diary entry John recorded there. Each subsequent campsite is similarly marked on the map, and linked to a text file containing a transcription of that day's journal entry, followed by commentary and corresponding maps and photographs. Excerpts from William Bartram's writings in Travels and in "Travels in Georgia and Florida, 1773-74: A Report to Dr. John Fothergill" are paired with his father’s remarks from the 1765-66 expedition. The writing styles of the two men differ greatly. John's prose is brief and to-the-point, a scientist reporting on the soil and terrain. William's musings are the product of a natural philosopher contemplating God, man, and beauty in the exotic state of nature that Florida represented in his romantic imagination. For many generations Travels has been considered a literary and artistic masterpiece by readers throughout the world. Examples of William Bartram's considerable talent as a nature artist are also linked to the journal entries to coincide with locations where either the father or the son observed a particular plant, bird, fish, or flower. Viewers should note that when Bartram indicates the Battoe traveled "upriver," or when he refers to a site as "above," he means the direction is generally to the south; correspondingly, when reference is made to "downriver" or "below," the direction is to the north. The St. Johns is one of the few major rivers in the world that runs to the north. Bill Belleville, River of Lakes: A Journey on Florida's St. Johns River (Athens, GA: University of Georgia Press, 2000). Edmund and Dorothy Smith Berkeley, editors, The Corresondence of John Bartram, 1734-1777 (Gainesville, FL: University Presses of Florida, 1992). Edmund and Dorothy Smith Berkeley, The Life and Travels of John Bartram: From Lake Ontario to the River St. John (Tallahassee, FL: University Presses of Florida, 1990). Edward Cashin, William Bartram and the American Revolution on the Southern Frontier (Columbia, SC: University of South Carolina Press, 2000). Joseph Ewan, William Bartram: Botanical and Zoological Drawings, 1756-1788 (Philadelphia, PA: Memoirs of the American Philosophical Society, Volume 74, 1968). Francis Harper, editor, John Bartram, Diary of a Journey through the Carolinas, Georgia, and Florida, from July 1, 1765, to April 10, 1766, Transactions of the American Philosophical Society, n.s., Vol. XXXIII, Pt. I. Philadelphia, PA, 1942. Francis Harper, The Travels of William Bartram: Naturalist's Edition (Athens, GA: University of Georgia Press, 1998. Reprint of the Yale University Press 1958 edition). Thomas P. Slaughter, The Natures of John and William Bartram (New York, NY: Alfred A. Knopf, Inc., 1996). Thomas P. Slaughter, William Bartram: Travels and Other Writings (New York, NY: The Library of America, 1996). Gregory A. Waselkov and Kathryn E. Holland Braund, editors, William Bartram on the Southeastern Indians (Lincoln, NE: University of Nebraska Press, 1995).